We operate in a hybrid world, yet we do not fully realise it. 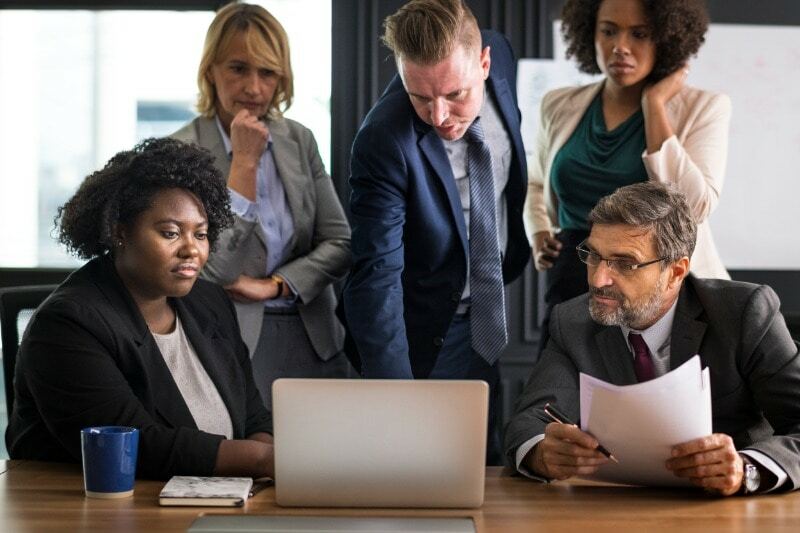 In the wake of the consumerisation of IT, employees are leaning more on their everyday devices to access Office365 or Sharepoint, and the tendency to utilise alternative technologies has increased. 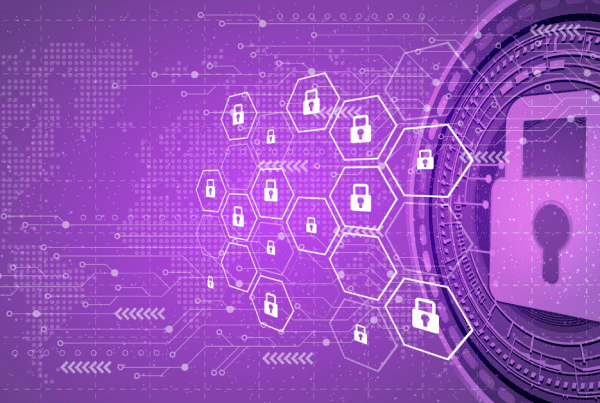 This makes sense if the sufficient applications are not available, yet there appears an even higher risk and vulnerability for your enterprise environment. If you do not open these opportunities for your employees, your employees will continue to lean on ‘Shadow IT’. The pervasive move towards ‘Do It Yourself’ has opened many vulnerabilities to end users less professional in adhering to security measures and best practices. Enterprises must implement security, which immunises them from infection, or intrusion, which could result from sharing applications with ‘rogues’ and ‘amateurs’. Here’s a fun fact: 1,946,181,599 – the total number of records containing personal and other sensitive data that have been compromised between 1 January 2017, and 20 March 2018. How can you identify, build and manage the exact secure and compliant solution that allows you to build in customised secure applications that avoid these external devices or platforms from unnecessarily filling the gap? 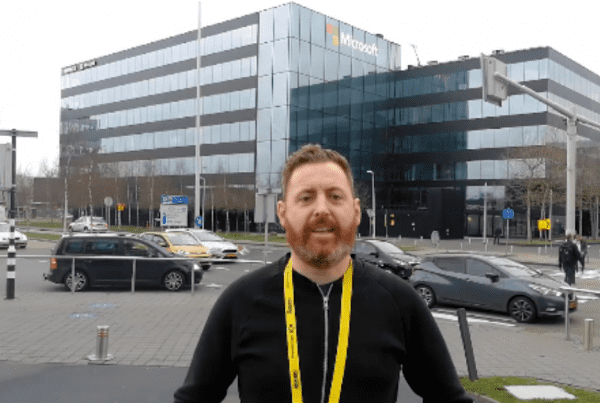 Microsoft believes that providing employees with better, safer, and easier networks results in higher engagement, productivity, and satisfaction. In today’s world, that means seamless communication and multi-device experiences, which bring teams together and helps drive digital transformation. The knowledge on how to prepare for attacks is gained from visibility in the threat landscape. 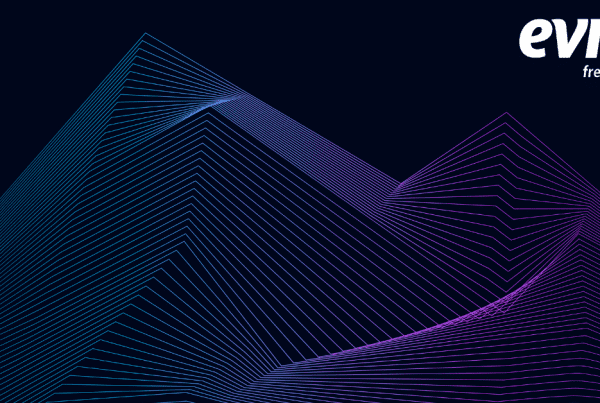 Visibility is understanding several factors of a cyber-attack including the attack type, the attack target, the time of attacks, the frequency of attacks, the origin of the attacks, and ideally and ultimately, the attacker. 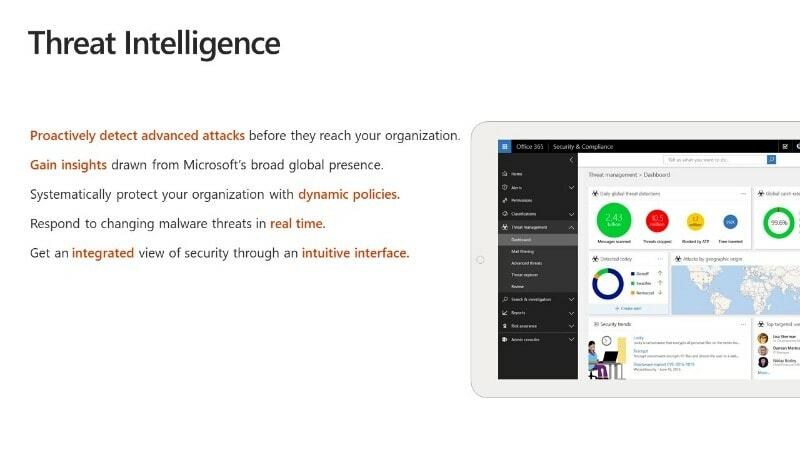 Office 365 Threat Intelligence is the tool which equals the playing field against today’s sophisticated cybercriminals, by taking Microsoft’s broad visibility over the threat landscape, Microsoft’s powerful AI and computing which provides rich insights and ultimately provides policy recommendations that enable you to be proactive about your cyber-defense. The Threat Dashboard is designed to provide simple threat insights for any role (CSO, security analyst, IT generalist). The interface is intuitive enough that it doesn’t create a barrier for small organisations with basic needs, while drilling down deeper provides detailed information that will meet the needs of larger organisations with more complex security deployments. 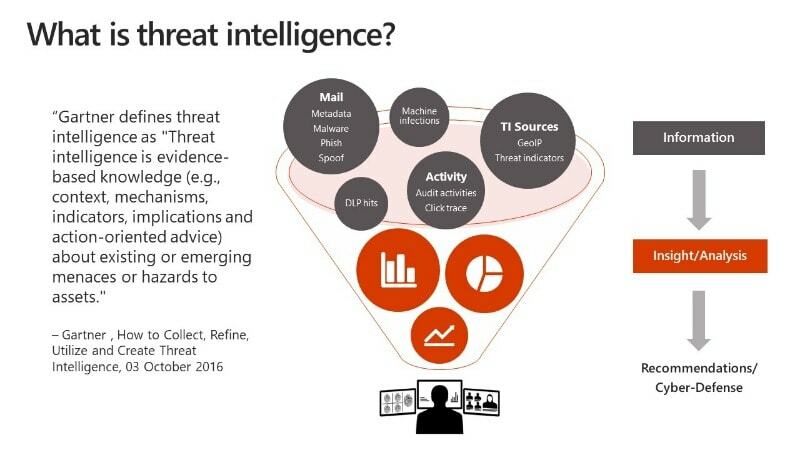 NOTE: Office 365 Threat Intelligence is available in Office 365 Enterprise E5. If your organisation is using another Office 365 Enterprise subscription, Office 365 Threat Intelligence can be purchased as an add-on. Evros knows selecting the right Microsoft 365 plan for your enterprise will be determined by the sensitivity of data your company must protect, the amount of regulation your company face, and how and where your employees access data and apps. Don’t leave your data vulnerable: Visit Evros Microsoft365 to find the right M365 fit for your company.